When it comes to buying something that lasts, EVA foam rollers are the only way to go. If you get a cheaper EPP roller, rest assured that, in spite of the manufacturer’s claims, it will warp and become flat before you say “foam roller”. I got talked into buying a set for one of my classes. The reviews said the roller would remain firm and in great shape over time. Not true. I only used mine once a week with the class for less than a year and the top of the roller caved in. You cannot roll on a flat roller! EPP rollers WILL NOT LAST if you do proper exercise on them. 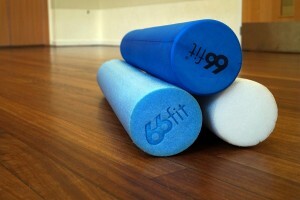 If you want something for the occasional myofascial release, then get any roller. But if you want to actually work out on it, forget it. You need the proper stuff. Besides being very sturdy and firm, EVA rollers have the advantage of being non-slippery as well, unlike their shiny cheaper counterparts. That’s useful if you are leaning against the roller sideways and want to actually roll, not skid or slide, across the floor. An EVA roller will never just slip from underneath you. How long should your roller be? I use ones that are 90cm long, a length which will support the whole of your spine and the base of your head. If you come to my classes, that’s the one to buy. You can also buy one that is half the length but these are limited mostly to leg and hip work; you cannot position your whole body over one, unless you are very little! The width of the roller is not that crucial, although I would argue that the wider 15cm rollers provide more challenge for balance and is sturdier. But a 10cm roller will do, too. If you’d like to try a foam roller class, come either to BraveBodies Pilates class in Woolston, Southampton, on Wednesday noon, or to an evening Pilates class in Lowford, Southampton, at the Bursledon community centre at 7pm. Here are some that I have had very good experience with. No warping after years of use.